Gaudete! Christus natus est! Alleluia! Tonight God’s purpose in creation is fulfilled. Detail of reredos in Nativity Chapel, the Cathedral Church of St. Paul, Detroit. Photo by the author, who is not too proud to admit this. And yet, isn’t that true of us, too? Human DNA is now in the Godhead. That is the radical truth of Christmas. Tonight (paraphrasing Ireneus), God became human so that humans may become divine. All flesh is involved, too, because all flesh is related. By uniting creatureliness and uncreated Creator in his Person, Christ saves a cosmos that, of its own power, would tend toward extinction. Think of it as a rescue or a salvage operation; either way, creation was not meant to be disposable. It’s a miracle that anything other than God should exist at all. It’s a far greater miracle that God should enter creation. Again, this is no contingency plan. It was the point all along. God made us because God wanted to be with us, and God is with us, forever, in Christ. OK, I’m off by a day or two…Solstice is over, and the days begin to lengthen. But on this eve of Christmas Eve, here’s one more reflection on the coming of Christ. Fittingly, it’s the longest poem I ever wrote. feel myself absorbed into the void of the empty night sky. the yet-unknown object of my belief. will I fail to recognize it? Is it enough to believe? and I feel its cold penetrate my skin. Statue informally known as the “Spirit of Detroit,” by Marshall Fredericks. The sculpture sits outside the Coleman A. Young Municipal Center at Woodward and Jefferson Aves. Photo by the author. The Detroit city motto has become better known in recent years, thanks to the proliferation of books—about the city’s history, and, yes, about the ruins, by authors who live in the Metro Area and love the city—and of merchandise such as bookbags, t-shirts, postcards, and other items you might find at City Bird, the Detroit Merchantile Company, Pure Detroit, various Eastern Market vendors, pop-ups, or other local boutiques. Speramus meliora; resurget cineribus—We hope for better things; it will rise from the ashes. These words were penned by Father Gabriel Richard, a Catholic priest and a major figure in Detroit and Michigan history, after fire destroyed the city in 1805. What does it mean to “hope for better things”? Is it the same kind of hope as when children hope for a snow day, or when you hope your favorite team will win the game? I think the fact that it was written by a priest in the context of city-wide disaster suggests that Fr. Richard was thinking more along the lines of Christian hope, which I would define as the confidence we have in virtue of our trust in God, whom we know to be trustworthy. That’s a very different kind of hope. Which is well and good and quite encouraging, really, for Christians, and perhaps for other religious theists. But in today’s pluralistic context, even in a predominately Christian city like Detroit, I think it’s important to find where a similar kind of hope is accessible to all. Confidence from trusting in that which is trustworthy—where can we find that today? Not in City Hall, not in Kevyn Orr or Gov. Rick Snyder, not in Dan Gilbert or the Ilich family; not in the economy, certainly not in the strength of the U.S. Dollar. Not even in the ideal of democracy, which is so clearly broken. 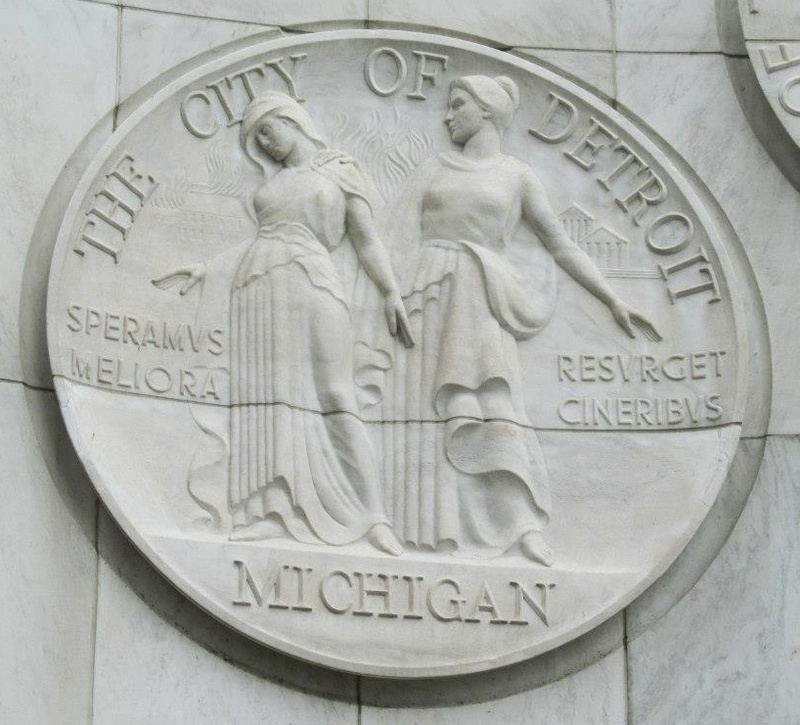 I would suggest we find that secular version of confident hope in the people of Detroit: in its people of good will, whose civic identity and spirit, I think, is characterized by strength, loyalty, pride, and resilience. “Detroit hustles harder,” as they say. The religious meaning of hope is, I think, primary; but it’s important even for those of us who consciously place our trust in God to also discriminate among those objectives vying for our hope in the world around us. We’re fooling ourselves if we think we place our trust in God, and also place it in an earthly savior, such as a corporate benefactor or a politician. We’re fooling ourselves if we think we “seek first the kingdom of God and its righteousness” but also chase after economic security before all else. But for people of faith, hoping in God is always done in community, as community. Jews, Christians, and Muslims are people of covenant. We believe God calls peoples into covenant with Godself, and so we simply cannot fully trust in God without each other. 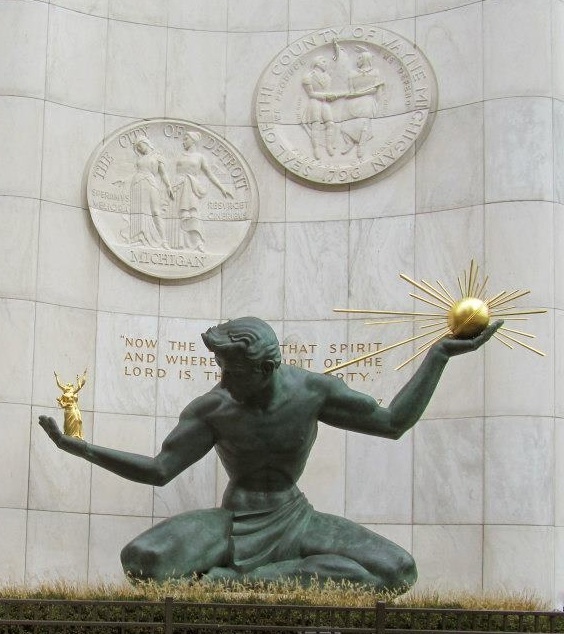 To trust in the human spirit—in this case, the spirit of Detroit—requires civic engagement, concern for one’s neighbor, and holding virtues like charity, commitment, and forgiveness above the shiny distraction of money. It requires creativity, sharing, peacemaking, and hard work—but not just the individualistic hard work of earning one’s own living. It is entirely congruent, I think, with trust in God, because God’s dwelling is among the people. (If you don’t believe me, go read James Cone or Jim Perkinson, or any of the Liberation Theologians.) If we are to trust in one another, though, we must work, as a people, to be trustworthy—to be worthy of this confident hope. Thankfully, we bear this task together.What kind of city do we want to build? What Detroit do we want to be? Official city seal, also at city hall (visible on the upper left in the image above). Photo by the author.